A picture is worth 1,000 words, right? Wrong. Photographs, videos, GIFs, graphs and other forms of visual media are worth more, because without them, your 1,000 words may never be seen. The integration of visual elements within articles, social media posts, web pages, newsletters, print materials, and other media formats is a sure way to capture the attention of consumers, make your content relatable and understandable to the consumer, and it allows information to be processed faster. Continue reading for a quick look into the four reasons why you should integrate visual media within your content, and how you can get started doing so. Picture this: You’re scrolling through Facebook, what makes you stop and look further into a post? Most likely, it’s the profile picture of an account you’re interested in, or the visual element they included in their post. Photographs break up the text on our feeds, guiding our eyes where to focus, and capturing our attention. Alright, now have you ever shared a video you saw scrolling through social media with a friend? If so, you’re not alone. The Interactive Advertising Bureau found that 95% of people say they share mobile video content with others. This is because visual media allows people to relate with the content. It may spark a memory or emotion in the viewer, and they are likely to remember the content much longer than a barren headline. Visual media helps readers clarify and comprehend information because they are able to develop their own perception of the content and avoid misinterpretation. For example, a video of an interview would be more understandable than a written article because the viewers are able to see the subject’s body language and hear the intonations of their voice, where these details could be lost in a written article. Did you know that humans process visuals 60,000 times faster than text? In this fast-paced world, you are competing with millions of others for the attention of your target audience, so when you capture it, keep them engaged with content they can understand quickly. How do you know what type of visual media to share? This depends on what kind of content you have the budget for and permissions to use. Above all else, make sure that you have the rights to post the content and the permission of every individual/piece of art featured in the photo. Many companies use visual content created by their in-house employees, an agency, freelancers they work with, or they purchase it from stock companies like Envanto or Alamy. 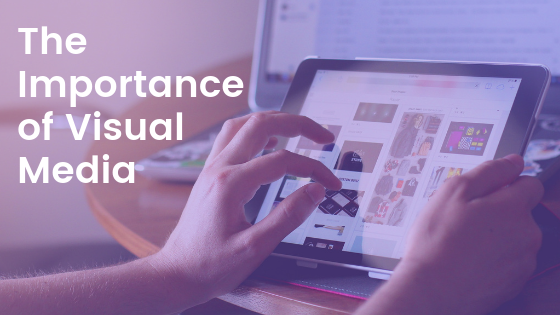 When deciding which piece of visual media is appropriate for your post, consider your brand budget, character, audience and the post’s content. Research done on the communications industry is recognizing videos as “the biggest way to reach people today.” People may say that a photo is worth 1,000 words, but Forrester Research says that a 1-minute video is worth 1.8 million words. Videos are projected to make up 80% of consumer internet traffic in 2020 (Cisco), and 60% of people surveyed by MarTechSeries say they visit a publisher’s page or profile after viewing a social video, which is a key measurement used to evaluate campaigns. However, don’t count photos out. The 2018 Industry Report by Social Media Examiner says 32% of marketers say visual images are the most important content for their business. Facebook Business advises that the strongest campaigns use a combination of static and moving imagery. 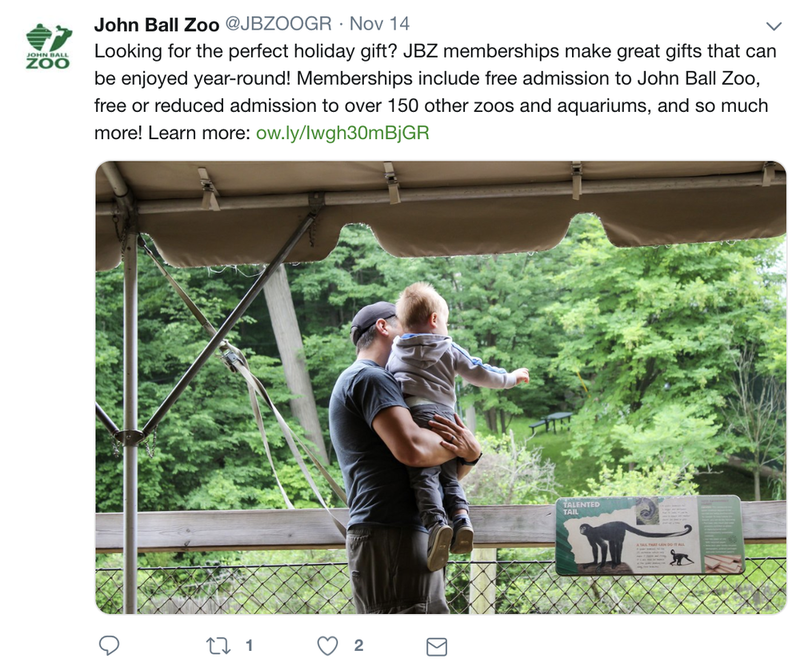 The John Ball Zoo in Grand Rapids effectively incorporates photos on Twitter to engage with their audience. In this post, the photo catches attention and builds an emotional connection with the viewer. Scrolling through their timeline, one may notice the bonding between a child and its guardian, then desire the same for their own family or someone they know. They read that they can give these experiences as a gift and may click on the URL for more information, retweet it to their profile, favorite it, or comment/tag their friend. Boom. Successful and measurable engagement. 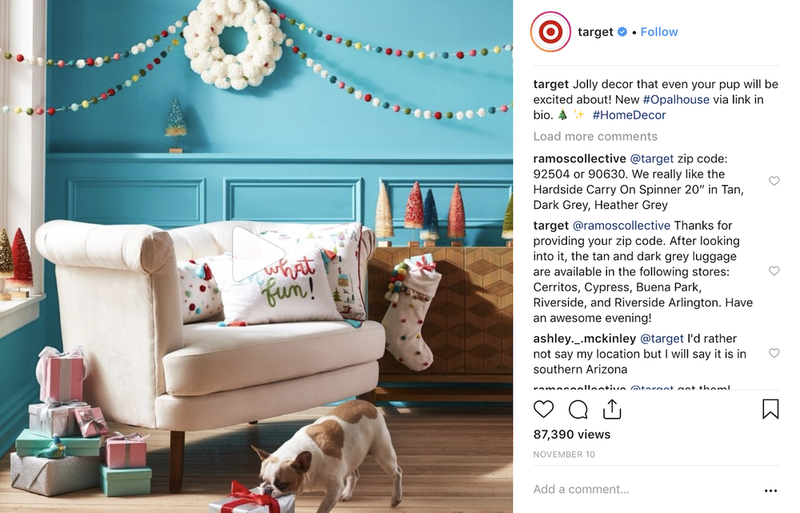 In this post, Target used a GIF to show a dog enjoying the holiday decorations while pushing a present around the room. This was a great visual media decision because it ties perfectly with the caption and brand character. The motion picture will catch user’s attention, then hold onto it for a few seconds because the GIF is on repeat, and who can resist watching a cute pup more than once? The Food Network on Facebook provides a great example of when to incorporate video. In this post, they include a concise caption and a quick 1-minute video inspiring viewers to create a new version of the traditional gingerbread house, the “Candy Cane” house. 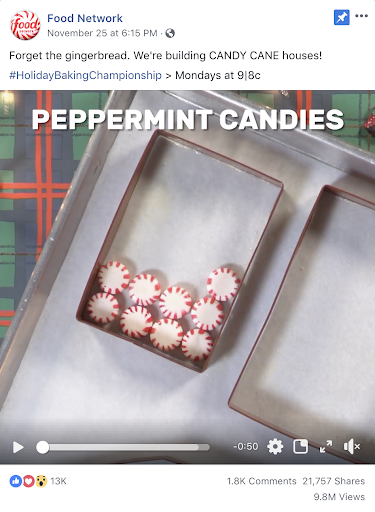 Because this video showcases a simple activity that’s fun for children and adults, it encourages viewers to see more creative food activities by watching Holiday Baking Championship on Mondays at 9|8c. This video is also an effective use of visual media because it is purposeful when watched with or without the sound. Commonly, people will watch social media videos without the sound because they are in public or a quiet space. It is important to include text or subtitles so that the video remains captivating. Next time you go to schedule your social media content or write a blog post, don’t forget the graphics! Every piece of visual media you share is an opportunity to catch your audience’s eye and build a stronger relationship with the viewer. Emily M. Gagnon is a junior at GVSU majoring in Advertising and Public Relations with a minor in Digital Studies. 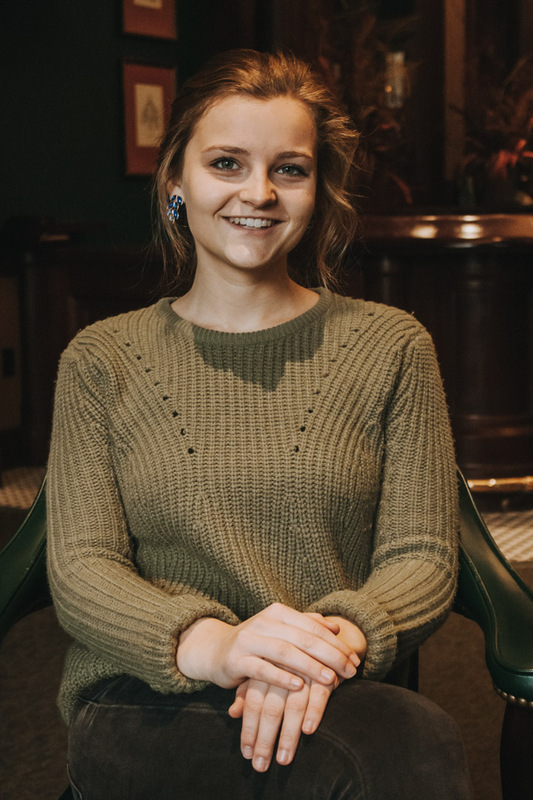 Through her involvements with PRSSA, GrandPR, and TEDxGVSU, she has grown passionate about developing relationships with and learning from the exceptional people around her.